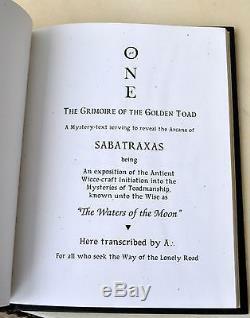 ONE: Grimoire of the Golden Toad Andrew Chumbley Signed Talismanic Extras + Stave/Wand incl. 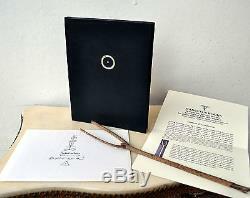 COA Xoanon Witchcraft Cultus Sabbati Occult Grimoire Ltd Ed One of 77. 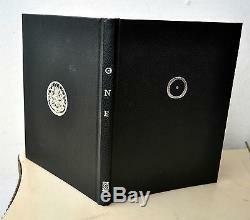 ONE: The Grimoire of the Golden Toad. 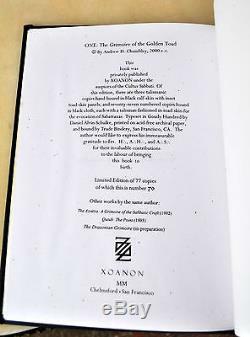 Xoanon, Chelmsford, San Francisco, 2000. Limited Edition One of 77 copies, this being #70. 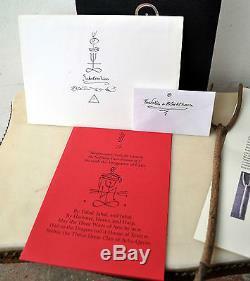 Comes with Talismanic extras, signed and sigilised by Andrew Chumbley. 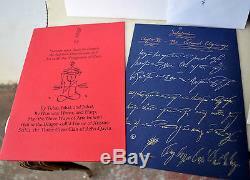 Accompanying the book is a large white envelope, inscribed "Sabatrachion" by the author & sigilised. Inside is a red printed card, folded once, which has been sigilised twice on the front, and signed & sigilised on the back. 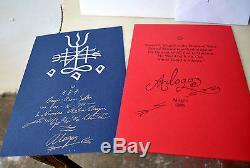 Inside the red folded card, is a single dark blue sheet of light card, which has been heavily sigilised in silver ink, followed by an inscribed text in gold pen, and signed Alogos. On the reverse side, there is inscribed the title "Sabatrachion", followed by "Chapter VI - The Nocturnal Pilgrimage", followed by 7 lines of magical script. This text, is part of the "Shadow Grimoire", of. The Grimoire of the Golden Toad. 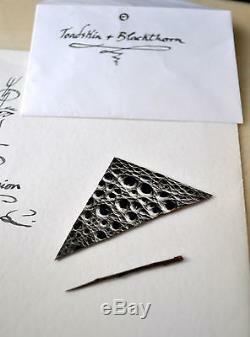 The large envelope, also contains a small white envelope, inscribed "Toadskin + Blackthorn", which contains a blackthorn spike and a talisman, made from a triangular piece of toadskin, which has been painted on one side, using gold metallic paint & green ink. In addition to these talismanic items, the book was acquired by the previous owner, from someone who worked magically with the author, passing on to others oral teachings that supplemented the written text of the Azoetia. The book was passed to the... Owner with a stave, a naturally occurring branch that has grown into a'Y' shape, a symbol of power in the Traditional Craft, a magical artefact of the current brought through by Andrew Chumbley and his close associates... 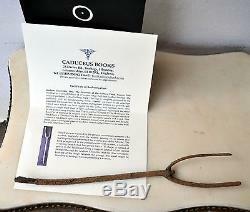 Quoted from COA provided by Caduceus Books. 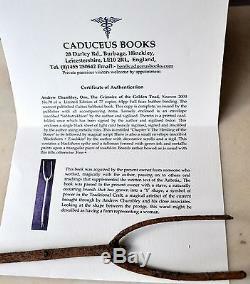 It is believed that the wand/stave was given with the book (and the talismanic extras) to the original owner (who was a high-ranking member of the Cultus Sabbati, and was authorised to teach and train others in the Craft), by Andrew Chumbley. The importance of this provenance, and association cannot be highlighted enough. What is being offered here, is not just another copy of. On offer here is a very unique, authentic and talismanic magical artefact, which embodies, and is pregnant with the Crooked Path current of the. As conceived by Andrew Chumbley, and used and practised by its highest ranking members, in their work with the. This is a unique opportunity! 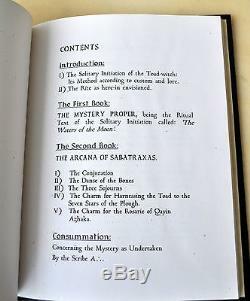 Check out my other items as I have other very rare books from Soror Pasht Akhti's collection, as well as many other rare books by Andrew Chumbley, Daniel Schulke, and many other Cultus Sabbati books & art prints, published by Xoanon & Three Hands Press. I also have a wide selection of fine & limited editions, published by Fulgar, Ixaxaar, Ouroboros Press, Scarlet Imprint, Soceity of Esoteric Endeavour, Starfire Publishing and more. Be sure to add me to your favorites list. As I will be listing many other Rare & hard-to-find books, artworks and many other items of interest. 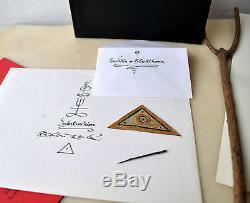 The item "ONE Grimoire Golden Toad Andrew Chumbley Signed Talisman Extras Wand COA Xoanon" is in sale since Tuesday, January 05, 2016.